Mountains are limited in southeastern Michigan, but there are still plenty of forested trails and hilly terrain for cross-country skiing. 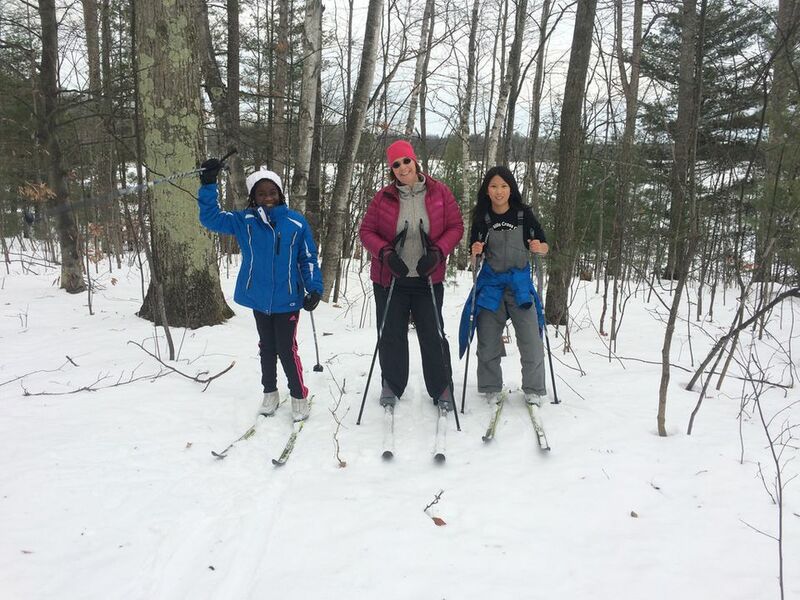 Whether you want to rent skis or bring your own, cross-country skiing in Oakland County is a fun, challenging, and active sport to engage in during the long winter months. There are state parks, forest campground or trail system located no more than 30 minutes from major cities in Michigan. Find directions, details and facilities information at the Michigan Recreation Search website. Bald Mountain State Recreation Area in Lake Orion has 8 miles of trails for cross-country skiing through hilly terrain (some of the hilliest in Southeast Michigan) in its North Unit. Highland Recreation Area in White Lake has 17 miles of trails. Holly Recreation Area has trails that range from .25 mile to 25 miles. Ortonville Recreation Area in Ortonville Township has 2.5 miles of trails. Pontiac Lake Recreation Area in Waterford has 11 miles of trails. Proud Lake Recreation Area in Commerce Township has 6 miles of trails. Seven Lakes State Park in Holly has trails that range from .33 mile to 2 miles. Most of the MetroParks in southeast Michigan are open for cross-country skiing, but they vary regarding exactly what resources they offer. Milford: Kensington MetroPark in Livingston and Oakland Counties has over 12 miles of groomed trails through various terrain, including a golf course. It also has a ski center with heat, restrooms, snacks, and skis rental for $15.00 on weekends and holidays. Shelby Township: Stony Creek MetroPark in Macomb and Oakland Counties has over 13 miles of groomed trails through woods, over hills, and across a golf course. It also has a ski center with ski rental for $15.00 on weekends and holidays. White Lake: Indian Springs MetroPark has over 12 miles of trails through various terrain, including woods and a golf course. Auburn Hills, Pontiac, Rochester: Clinton River Trail is a 16-mile long trail that runs along a former railroad track. Clarkston: Independence Oaks County Park has 10 miles of groomed trails. Ski rental ($10) and lessons are also available on weekends. Commerce Township: Hickory Glen Park is open for cross-country skiing. Davisburg: Springfield Oaks County Park is open for cross-country skiing. Farmington Hills: Heritage Park is open for cross-country skiing. Farmington Hills: Glen Oaks County Park is open for cross-country skiing. Holly: Highland Oaks County Park has 1.5 miles of mowed trail. Holly: Rose Oaks County Park is open for cross-country skiing. Lake Orion: Orion Oaks County Park has 10 miles of trails (not groomed). Lake Orion, Rochester: Paint Creek Trail is an 8.5-mile trail made out of a former railroad track. Leonard: Addison Oaks County Park has 6 miles of marked (not groomed) trails. Madison Heights: Red Oaks County Park is open for cross-country skiing. Novi: Lakeshore Park is owned by the City of Novi and open for cross-country skiing. Orion Township: Polly Ann Trail is open for cross-country skiing. Rochester Hills: Bloomer Park is open for cross-country skiing. The trails in the city-owned park are not groomed. South Lyon: Huron Valley Trail is a 10.5-mile trail that runs along a former railroad track. South Lyon: Lyon Township Community Park is open for cross-country skiing. South Lyon: South Lyon Rail Trail is open for cross-country skiing. Waterford: Drayton Plains Nature Center has over 3 miles of trails. West Bloomfield: West Bloomfield Wood Nature Preserve and Trail has a 4.5-mile trail that runs along a former railroad track. White Lake: White Lake Oaks County Park is open for cross-country skiing. Wixom: Lyon Oaks County Park has 4 miles of trails (on a crushed stone path). Oakland County has several parks and recreation areas open for cross-country skiing; but if you’re a new skier, chances are you’ll need to rent skis and may even want a lesson. Kensington and Stony Creek MetroParks offer 12 miles of ski trails, ski rental, heated resting areas, and snacks, Independence Oaks County Park in Clarkston also offers lessons.